My hike on Mount Santubong was an amazing experience. The hike was quite challenging; very step climbing for a long time. The trail climbed like this for a long time. The ropes could help you climb (especially necessary if there had been rain recently as it is not only steep but slippery when went). 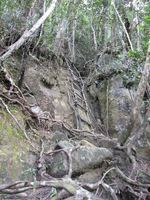 Quite frequently rope ladders were necessary to aid the climb. The Rhinoceros Hornbills I saw on the hike were amazing. Abuse of the credit system by 3rd party collection agencies (and credit reporting agencies) in the USA has been a long term problem. An attempt to partially address some of the abuses was a change in the required reporting practices that impacted collections accounts specifically, known as the National Consumer Assistance Plan (NCAP), which rolled into effect during the second half of 2017. This was a small good step in protecting consumers from the bad behavior of credit reporting companies and their customers. But much more must be done to protect us from having our financial lives negatively impacted by bad practices of the credit reporting companies. The best form of problem solving is to avoid problems altogether. This is a simple idea. Still many organizations would perform better if they took this simple idea to heart. Many organizations suffer from problems, not that they should solve better, but problems they should have avoided altogether. What Loss Will a Business Suffer Due to a Dissatisfied Customer? You can’t know how much a dissatisfied customer will cost your business in the long run. You can make statistical judgements about how costly dissatisfied customers are to a business but those are loaded with many guesses. They can give a general indication of the magnitude of the costs but they are largely guesses, not something you can measure. Sometimes a business largely gets away poor quality for a long time. The customer doesn’t change behavior, doesn’t complain to others and doesn’t punish the company in the long term. But you never know when one small failure will cause the luck to run out and turn a customer against the business and costing it dearly. continue reading: What Loss Will a Business Suffer Due to a Dissatisfied Customer? Today my car wouldn't start. I guessed the battery died. I try to use Lyft. Their app says it is a bad connection and so it won't work (using iPhone on Sprint in Charlotte, NC - the 17th largest city in the USA). Sad but ok, whatever, deal with it. Ok try my iPad mini with ATT. Lyft connects and doesn't let me use it requires putting in a phone number before it will do anything so that I can get pin and give it to them. Ok, give them the number. Nothing ever comes from them. Ok try Uber on iPhone. Uber asked for permission to spy all the time (not just when you are using Uber). Decline that intrusion. Now it can't find my current location. So I type it in. It finds it. Uber says it isn't available where I am and only offers their "luxury" options. Google has been really bad at UX (user experience) for a long time. I use RSS feeds to manage the content I want to enjoyand it works great (for blogs and You Tube and podcasts). Thankfully Google hasn't broken this yet (though given their track record in the last 10 years it would not surprise me if they do at some point). Of course it will be easy for creators to generate their own RSS feed for their videos if Google does break it. I created several feeds on my personal site for (selected blog posts by John Hunter and a time travel feed for my blog posts*). I enjoyed my visit to the Stone Forest (South China Karst) area. It was a shallow sea some 270 million years ago (the Permian period) when the sandstone and limestone deposits were formed. The entire Shilin National Scenic Area covers an area of 400 square km. I think too often people (in relation to management ideas) demand that things be made more simple than is possible to adequately understand the systems involved. This of course leads to problems. A huge value provided by people like Russell Ackoff is their ability to help explain what is needed in fairly simple terms. Still understanding how these ideas are being expressed in our management systems and how to apply the concepts to our management systems is still a challenge. I think one of the big differences between the best lean efforts and the others is the increased value placed on deeper understanding and thinking systemically. Product quality, in many ways, has been raised in the last few decades and this naturally results in raised expectations. This pattern was well known in the 1960s (and before). Kano’s theory of customer satisfactionexpressed how new features moved from being “delighters” for customers initially and eventually became minimum expectations (you gain no credit for delivering them but will upset customers if you fail). That Russians used propaganda and misinformation to attempt to get voters to vote for Trump is important. But the main thing that should have prevented those attempts is sensible critical thinking. The best defense against propaganda is critical thinking and transparency. If the population is trained and accepts being lead to conclusions with obvious propaganda it doesn't matter if you shut off one path for propaganda, others will emerge. What you need to do is create an expectation of reasoned debate. Sadly the USA has done a very poor job of this. We have allowed politicians get away with obviously false claims. We have promoted not critical thinking but the unthinking following of propaganda. Until we greatly increase the respect for critical thought and debate we are in trouble. It doesn't matter much what form those seeking to use propaganda use to manipulate people what matters is how susceptible a large number of people are to propaganda. The Federal Reserve Bank of New York’s Center for Microeconomic Data today issued its Quarterly Report on Household Debt and Credit, which reported that total household debt increased by $193 billion (1.5%) to $13.15 trillion in the fourth quarter of 2017. This report marks the fifth consecutive year of positive annual household debt growth. There were increases in mortgage, student, auto, and credit card debt (increasing by 1.6%, 1.5%, 0.7% and 3.2% respectively) and another modest decline in home equity line of credit (HELOC) balances (decreasing by 0.9%). Outstanding consumer debt balances by type: $8.88 trillion (mortgage), $1.38 trillion (student loans), $1.22 trillion (auto), $834 billion (credit card), $444 (HELOC). Coping with this issue (of avoiding unpleasant, systemic and long term rather than acute problems) is one of the things that separates great corporate culture from decent or bad corporate culture. If there are fairly obvious or fairly easy improvements those would likely be acted on. There are, rarely, but still sometimes, instances where those vocal or politically powerful individuals who would lose out in a fairly obvious improvement will prevent action. I am not convinced there are not ways to improve the situation. And I am pretty confident it is important enough to try. And I believe (though I might be wrong) with a concerted effort of knowledgable people improvements that would make a big difference in the quality of life could be achieved. I am not so certain those people involved in leading the effort would be seen in great lights though even if they "succeed." People are much more likely to remember negative consequences to them personally, even if they gain much more than they lost overall. I think many of these advances are moving so quickly that we are not properly thinking about the long term future of our organizations. The disruption these changes will take will be difficult to predict and plan for.